At 2018 on October 26, the Beverly Fire Department responded to a report of a motor vehicle accident with multiple injuries at the intersection of Elliott and Rantoul Streets. Upon arrival, firefighters found a two vehicle accident involving a Dodge Ram pick up and a Yamaha motorized scooter. The passenger of the scooter had been thrown on impact and firefighters and EMT's treated her for a serious leg injury and transported her to Beverly Hospital for further treatment. The operator of the scooter was found pinned under the scooter by the front end of the pick up trruck. Crews under the supervision of Deputy Chief Paul Cotter used the "Jaws of Life" rescue tool to lift the front end of the truck enough to remove the victim from underneath. Once removed, the victim was transported to the Helipad at Beverly Hospital where he was flown to a Boston Hospital for treatment of serious injuries to his leg and chest. At 0530, the Beverly Fire Department responded for a report of smoke in the building at Shaws Market in North Beverly Plaza. Upon arrival firefighters from Engine 5 found an extinguished fire in a storage area at the rear of the store. Bundles of paper towels were found to have small burn marks that were extinguished by store employees. Fire investigators determined the cause of the fire to be improper placement of combustible materials on a heating unit overhead. The items reached their ignition temperature and fell to the stock piled below. Damage was confined to one box and two bundles of paper towels. The store opened on time and no one was injured. Firefighters were clear of the scene at 0700 with a police and fire investigator remaining on scene until 1100. At 1231 on October 14, 2009, the Beverly Fire Department responded to a report of a chimney fire at 81 Corning St. Upon arrival, crews found smoke coming from the chimney, but no apparent source within the home. The homeowner stated that he had a fire in an interior fireplace the evening before, but the fireplace was clear with no debris and all heating appliances were functioning normally. On the orders of Chief Pierce, Firefighter Patrick Brady raised the aerial of Engine 5 to the roof of the structure so that Lt. James Archibald and FF. Joe Tucker could inspect the chimney and lower chains to remove any debris. After several attempts it was determined that the material was not in a portion of the chimney accessible to firefighters without removing some of the bricks. Crews from Engine 3 and Engine 1 dismantled a portion of the fireplace uncovering an excess of smoldering creosote and debris that was hidden the firebox and a second flue liner for the appliances in the basement. Once the area was exposed, firefighters removed the burning debris and advised the homeowner that the problems with the chimney needed to be corrected prior to relighting his gas heating appliances in the basement. The fire seems to have been caused by a buildup of creosote and debris in an area where those materials were not intended to collect. Deterioration of the chimney and fireplace system allowed those materials to collect in the void where the fire from the night before caused them to reach their ignition temperature and burn. The fire was confined to the masonry area and had not yet had a chance to extend to nearby wooden structural areas. There were no injuries and all units were clear of the scene by 1336. Initial crews stretched a hoseline to protect the structure and begin extinguishing the fire. After both Engine�s 1 and 5 used all of their tank water to knock down the heavy fire, Engine 1 laid a water supply line across Brimbal Ave to a fire hydrant. Due to the need for a supply line, Beverly Police shut down Brimbal Ave until the line could be shut down. Fire Investigator, and Incident Commander, Jeff Sirois is on the scene and will investigate the fire. There was no damage to the building but some smoke was drawn inside by air handling units on the roof. The Beverly Fire Department held its Annual Open House today at the Headquarters station. The event focused on spreading the fire prevention message with free educational handouts, props and videos on the importance of smoke alarms. Throughout the day, firefighters also put on demonstrations of the Jaws of Life, rope rescue and handed out free food. �This is a fun way to get people to think about fire prevention as well as the work we do as firefighters� said Lt. Bill Fiore. Many kids spent the day talking to Patches, the Department robot fire dog. Patches was purchased by the Department in 2007 as a result of a Federal grant for fire prevention and safety. Patches was purchased as a way to stimulate kids and get them to talk about fire safety, he has been a tremendous success. With money from the same award, a �Hazard House� was purchased that shows people different hazards that they can find and correct in their own homes. The Hazard House was also on display today. Other displays included the Department�s Dive Rescue truck and an ambulance from Northeast Regional Ambulance. The event lasted from 11 to 3 pm. 80 Papa Gino�s pizzas were given out as well as hundreds of hot dogs by Deputy�s Doggs. Dunkin Donuts, Super Sub, Star Sign and Liberty Mutual also donated to the event. Shortly after the Open House ended, the Department�s Dive Rescue team was dispatched to the waters behind Periwinkle�s restaurant in Essex for a vehicle in the water. The occupants of the vehicle were safely out of the vehicle and transported to the hospital. The Department responded with its Dive Rescue truck and four divers. Upon arrival, divers assessed the scene and put two divers in the water to locate the vehicle and assess its condition in the water. Divers Barry Lefavour and Matt Kowalski entered the water and found the vehicle and searched the area around the car. The two divers then attached a recovery strap to the vehicle and connected the strap to a tow cable to facilitate removal of the car. Once the vehicle was clear of the water, the divers were recovered and the team cleared the scene. 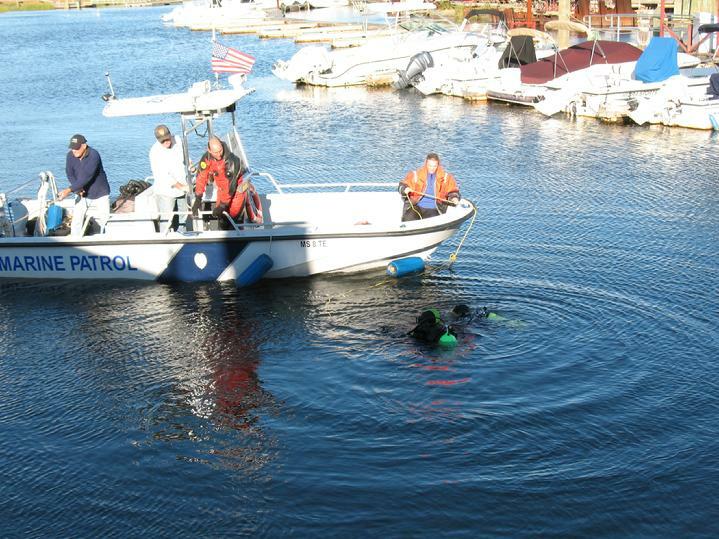 Dive team members conducted helicopter deployment training with the U.S. Coast Guard today. The training occurs roughly every two years and is designed to familiarize divers with the Coast Guard Jay Hawk helicopter. The training consists of two evolutions. The first evolution is a �dry drop� in which firefighters are lowered and raised from the ground using a Harness and the helicopter�s winch. During the second evolution, firefighters are flown out over the water and are lowered to the water by cable. The diver disconnects and swims to a rescue swimmer where they simulate a dive mission. The diver then requests a pickup and the helicopter lowers the cable to the diver who attaches it to the harness and is raised back to the helicopter for transport back to land.<?xml:namespace prefix = o ns = "urn:schemas-microsoft-com:office:office" /> The helicopter training is vital in order to prepare divers for what to expect during a real incident. They get the feel of being blasted in the face by water as rotor wash beats down on them from the massive helicopter above. During this bombardment, the diver has to be able to successfully manipulate all of his equipment as well as the Coast Guard cable and harness gear. Although not a typical deployment method, helicopter deployment might be necessary if divers are trying to reach trapped victims in overturned vessels out at sea. Beverly fire divers have been deployed in the past for such an emergency. All ten active Beverly divers participated in the drill at Lynch Park which lasted from 9am to 2pm. Divers will complete the training again in two years. Two of the divers that completed the training today had never been through a helicopter deployment before. Another accident occurred 10/9 opposite Brackenbury Ln. A single vehicle with a lone occupant struck a parked car around 100 this morning. The driver was uninjured but both vehicles had to be towed from the scene. The vehicle that was parked on the side of the road was sent into a nearby home but did not cause serious damage. Fire crews stood by until both vehicles were removed from the scene. The Beverly Fire Department was awarded $356,465 toward the purchase of a fireboat to replace an aging donated boat. The new boat will provide firefighters a rescue and firefighting platform that is far superior than any other fireboat the City has ever owned. For decades, the Department has used donated boats that were retrofitted for use as a firefighting tool. The conversions generally left the department with a vessel that was too small for use by its dive rescue team or unsafe for firefighters as they worked under dangerous conditions. The new boat will be designed and built with both rescue and firefighting purposes. The specifications for the new boat are being drawn up and the boat should be out for bid within the next two months.